Ashiatsu Oriental Bar Therapy is relatively new to the West. Ashiatsu Oriental Bar Therapy is an ancient form of massage practiced mainly in Asia. In 1997, a western twist was brought to Ashiatsu by Ruthie Hardee. 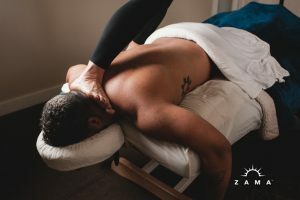 At Zama, our Ashiatsu is a combination of Swedish massage with long, flowing, deep effleurage and deep compression strokes. Ashiatsu Oriental Bar Therapy is performed with the therapist’s feet while using overhead bars to provide support and balance. Using leg and core strength along with gravity allows the therapist to provide a deep/broad pressure that cannot be achieved using the hands. Ashiatsu takes deep tissue to the next level! Ashiatsu massage is great for athletes on all levels. With the deep/broad pressure Ashiatsu moves a lot of blood to muscle tissues, assisting in recovery from those long, hard workouts. Increasing blood flow to the muscle tissues will provide relief to sensitive muscles. Ashiatsu massage is also great for those who just can’t seem to find a therapist who provides them with deep enough pressure. The broad strokes are much more comfortable than manual deep tissue massage, and the combination of even pressure and long strokes provides excellent spinal traction. Ashiatsu Oriental Bar Therapy is a truly unique style of massage. Visit us at Zama for the deepest, most luxurious massage in Portland, Oregon. Book your Ashiatsu Oriental Bar Therapy treatment today!